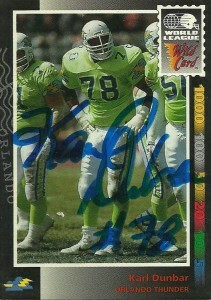 Cards: Ultimate WLAF 1991, Wild Card WLAF 1992. 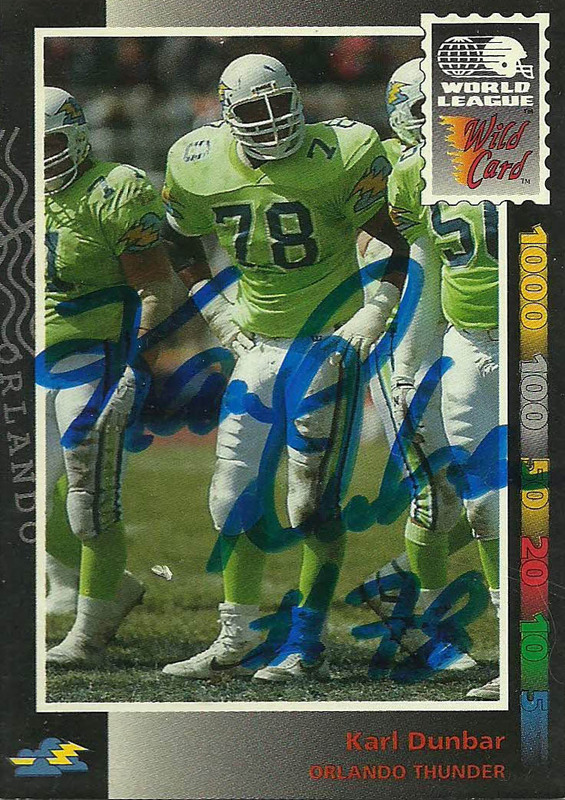 After playing at LSU (Karmichael) ‘Karl’ was drafted by the Steelers in 1990 and then played for the Orlando Thunder of the WLAF in 1992 finishing tied for first on the team with 5.5 sacks. 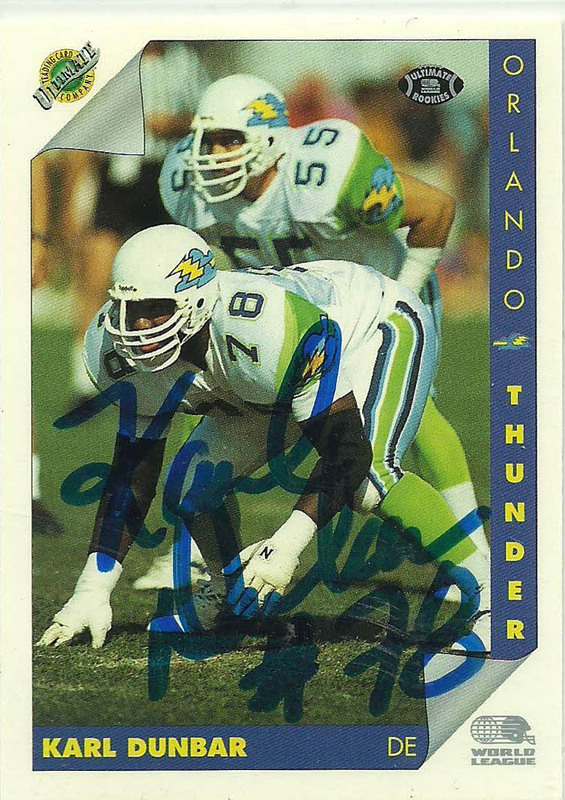 (He appeared in World Bowl II.) After the league reorganized, Karl became a journeyman, playing for the Saints for one year then jumping to the Cardinals for the next two retiring at the end of 1995 after playing for the Rhein Fire of the NFLE. With an insatiable love for the game, coaching had gotten in Karl’s blood, and he began to start working his way up the ranks starting from the high school level soon after. In 1998 he started coaching in college and in 2004 he was back in the pros working for the Bears. As of 2010 he’s in his 5th season as defensive line coach of the Minnesota Vikings. He is attributed with the success and emergence of the ‘Williams Wall’ and is considered to be a master technician. His name has been thrown around recently for head coaching jobs in college as well. Another former WLAFer, I was witness to the Thunder’s victory over the San Antonio Riders that season in 1992. The Riders kept it close till the 3rd quarter but then got blown out late. (Because there was only 3 divisions in the WLAF, the Riders who were really the 3rd best team in the league, didn’t make the playoffs that year, despite being 7-3.) I never got the cards for Karl until recently and sent them out with the photo memorabilia of the game for him. He responded in about a week, I’m sure feeling quite good about himself because his defensive linemen probably get all the autograph requests.